I’m back from outside Charlotte and I have to admit – I have no cooking or styling mojo left. Nothing that won’t be solved by a few days of R&R (rest and red wine). I’m making this post not because this photo is a vision…because it’s not. I’m posting about my dinner tonight to give a big shout-out to a blog that I visit quite often: Stephen Cooks. As far as recipes and home cooking go, this blog is the bees knees. 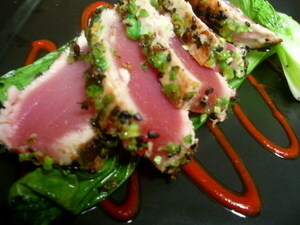 When Stephen posted about his wasabi pea crusted tuna, I swooned. On my trip this past week, I actually dined on a version of this dish…but knew it could be executed better. I stopped by Whole Paycheck and bought sushi grade tuna for just such dish. I have to say…its pretty fabulous. The flavors of the wasabi peas are killer with the tuna – I added some black sesame seeds to my coating. Rather than a dipping sauce, I garnished my plate with some Rooster sauce – out of sheer laziness – and called it a night. We’ll be back to our regularly scheduled photo standards soon enough. In the meantime, go visit Stephen Cooks. The original recipe for Tuna Crusted with Wasabi Peas can be found here. You’re right about Stephen. He cooks the way I’d like to if I didn’t have to spend so much time teaching school for a living. Your photo looks pretty great too if you ask me. Hi Tami…thanks for the notice, nice words, etc. I don’t want to take total credit for the idea though, since I got it from a post in Cin’s blog A Few of My Favorite Things — see http://fewofmyfavourites.blogspot.com/2006/02/wasabi-pea-crusted-barramundi.html — Enjoy your RnR!